With spring drawing near it is a good time to start planning your garden. Many patients are interested in growing CBD-rich cannabis for their cannabis therapy regimen. CBD, Cannabidiol, is a cannabinoid found in the cannabis plant usually in low levels, but sometimes at levels well over 10%. It has unique therapeutic benefits, which differ from those of THC. CBD can be a great source of relief from pain due to muscle spasticity, muscle convulsions and inflammation. Some conditions that may include these symptoms are Multiple Sclerosis, Fibromyalgia and Epilepsy. CBD has also been shown in studies to provide relief from feelings of anxiety. This is in contrast to THC, which exacerbates feelings of anxiety in many patients. CBD has also been shown to have powerful anti-depressant properties and to prevent the onset of pain due to neuralgia, the deterioration of nerves, resulting from certain chemotherapy treatments. CBD represents an advantage to many patients seeking a non-toxic alternative to traditional prescription medications. In contrast to THC, CBD is non-psychoactive, meaning it does not contribute to feelings of being “high”. In fact, for many patients, CBD actually lessens the psychoactive impact of THC they consume along with CBD. When taken in combination with THC, CBD actually prolongs the therapeutic effects of THC, such as pain relief, nausea relief and appetite stimulation. If you are considering growing CBD-rich cannabis from seed there are a few things you should know to ensure a successful outcome. 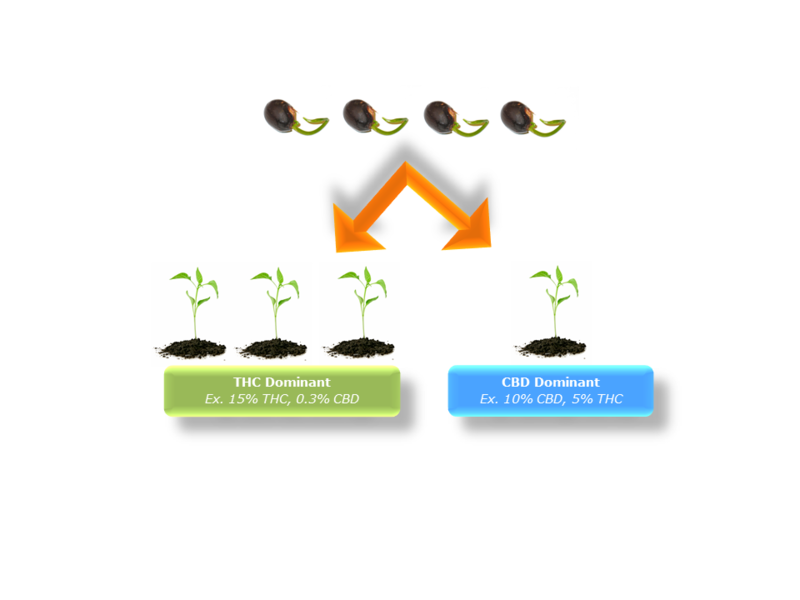 Pure Analytics has developed a program to test these CBD-potential seedlings during the vegetative stage. Often 3-4 weeks from emergence from the soil is an optimal time to perform this testing. This way, CBD-rich plants may be identified well before the flowering stage. Once identified, cuttings may be taken from these plants of interest for immediate growth to full-maturity flowering plants. In this way, you can achieve CBD isolation in a matter of weeks rather than months and be well on your way to growing a verified garden of CBD-rich cannabis at the beginning of this season. Performing this type of testing includes taking the top couple of nodes of the plant as a sample. This sample should be dried before it is submitted to the lab for analysis. the beginning of this season. Performing this type of testing includes taking the top couple of nodes of the plant as a sample. This sample should be dried before it is submitted to the lab for analysis.